What do you mean by Vegan? Veganism is a term meaning ‘non-dairy vegetarianism’. The term ‘vegan’ was first used in England in the year 1944, by Donald Watson, who is also the co-founder of the Vegan Society. The society was founded on 1st November which is now celebrated as Vegan Day. People following Veganism follow a strict vegetarian diet and refrain from the consumption of all dairy products as well as eggs. In other words, veganism is ‘the doctrine that man should live without exploiting animals’. Vegans, in addition, do not use any animal products or by-products, be it honey, wool, leather, fur, silk or soaps and cosmetics manufactured using animal products. Vegan Cheese is basically a non-dairy cheese. It is made from plant foods. This kind of cheese does not include rennet which is an extract from the stomach of animals, used in making cheese. There are many different brands which provide for different basic ingredients. As vegan cheese is plant-based, it can be made from solidified vegetable oil, soy protein, tapioca flour, pea protein, natural enzymes, vegetable glycerin, arrowroot, assorted bacterial cultures, and nutritional yeast and from nuts like cashew, almond, macadamia, etc. Why do people eat Vegan Cheese? People may choose to eat vegan cheese due to various reasons; for example, if they follow a vegan lifestyle which can be because of health reasons, for the preservation of the environment, or for ethical/moral reasons. They may choose vegan cheese, in particular, if they are lactose intolerant and thus, sensitive to milk and dairy products. What are the benefits of Vegan Cheese? For those of us following a vegan diet, vegan cheese is probably one of the best sources of protein. As it is a non-dairy cheese it contains considerably less amounts of saturated fats. Plus, it is cholesterol-free. Mostly it is free from preservatives and has fewer calories. It is also said to lower the risk of developing heart disease and type 2 diabetes. What are the different types of Vegan Cheese? 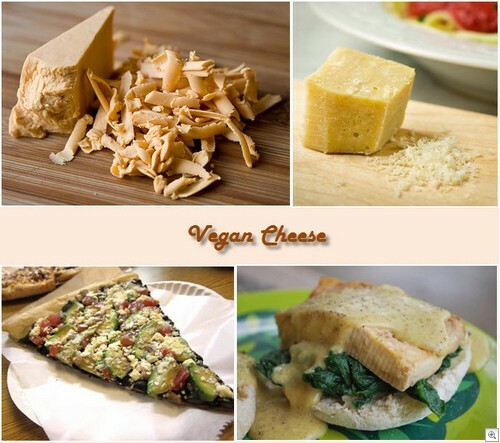 • Hard Cheese – Hard vegan cheese can be used as slices or grated. It is often used to make pizzas, lasagnas, sandwiches, sauces, scones, rolls or baked potatoes. Being non-dairy in nature, most vegan cheese varieties do not quite melt the same way as dairy cheese. Hard vegan cheese comes in cheddar, mozzarella and Gouda styles along with a few others. • Soft Cheese – This cheese has a smoother texture, similar to that of a cream cheese. It can be used as a spread on bread, scones, etc. It is known to come in a few added flavors as well such as Mexican style, garlic and herbs, etc. • Cheese Slices – There are many brands that offer vegan cheese slices, they are similar in appearance to the regular cheese slices and like them can also be used in sandwiches, which can be grilled, or baked as required. Like the hard cheese variety, it may be vastly different from the dairy cheese slices when it comes to melting. • Feta Cheese and Cottage Cheese – There are one or two brands that offer feta-style cheese. As far as cottage cheese is concerned, tofu is a good substitute for the same. If you are following a strict vegan diet, it is always best to take a look at the ingredients of food items purchased from the store, as it may contain some ingredients that are non-vegetarian in nature, like gelatin or some unusual flavoring which does not pass as part of the vegan diet. Casein is a substance derived from milk, it is used to bind the cheese together and improve texture. Some brands may use casein in their cheese, it is better to pick out a cheese that is specifically marked as ‘vegan’ when visiting the store. As the cheese is made from soy, rice, nuts and tofu among others, people with allergies to one or more ingredients must be careful when buying their cheese. Most of the cheese available is made from one base ingredient, so that people with sensitivity to the main ingredient can avoid that cheese.